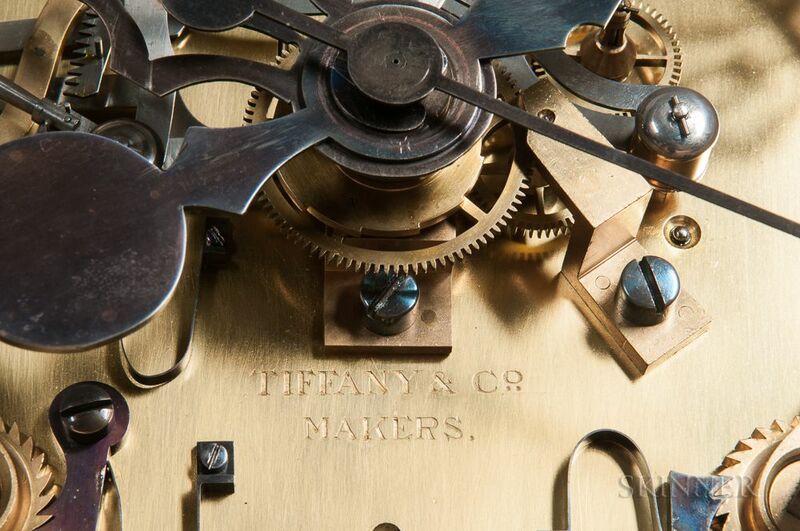 Rare Tiffany & Co. No. 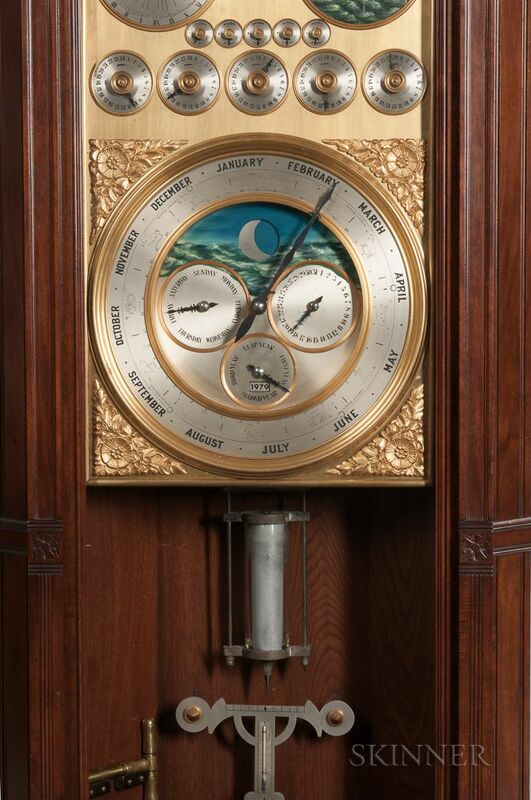 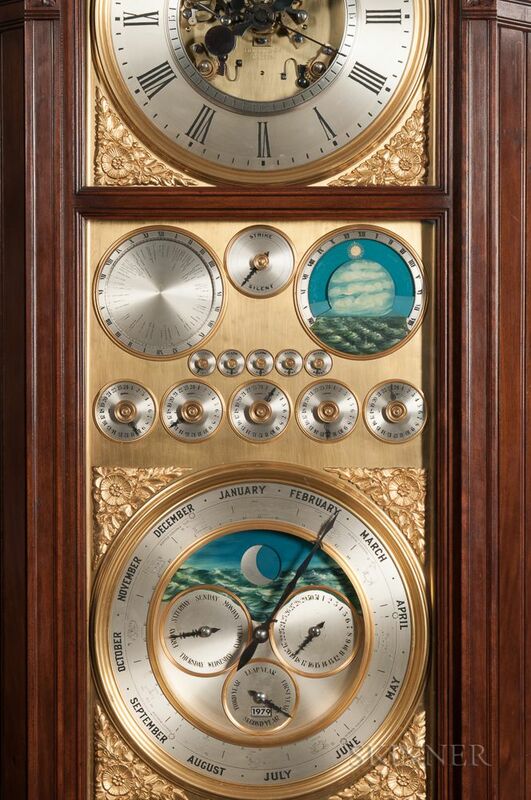 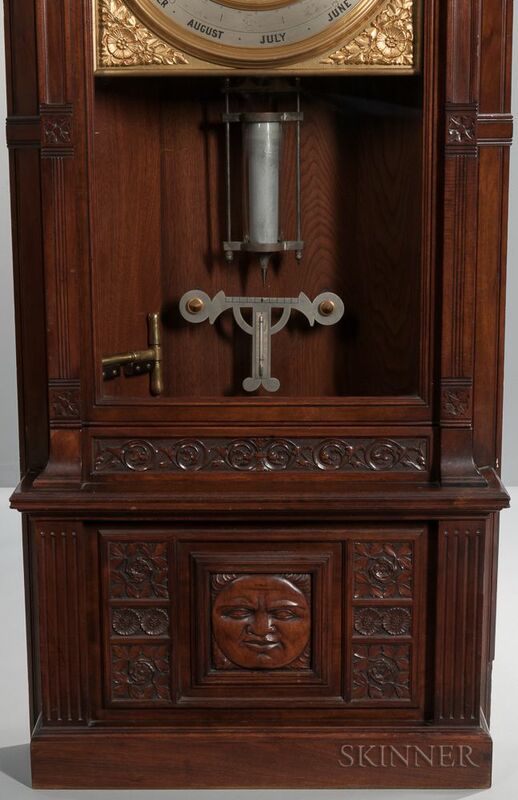 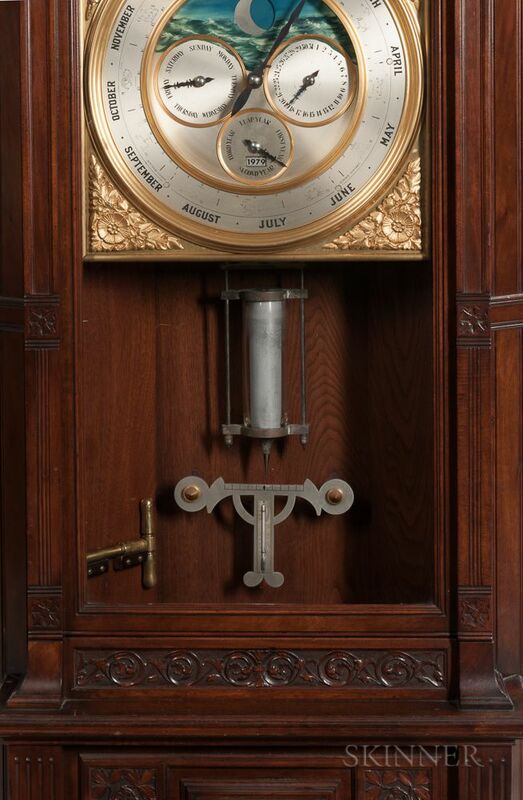 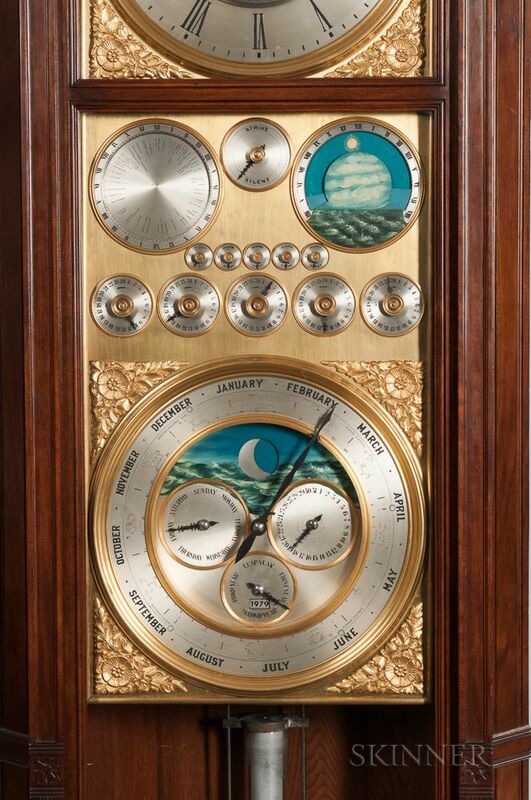 2 Astronomical Master Regulator, c. 1880, carved and applied molded mahogany corner case with a fully glazed hinged door opening to the 15-in. 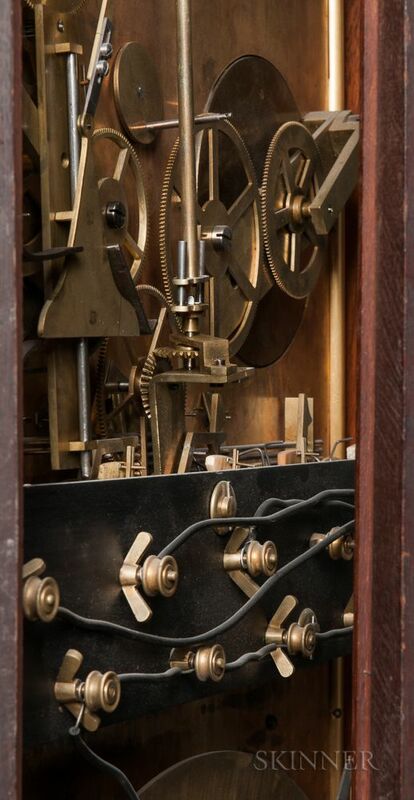 silvered roman numeral dial, inner seconds chapter ring, exposed escapement with engraved "Tiffany & Co. Makers," pierced blued-steel hands, and applied cast floral spandrels, 6 1/2-in. 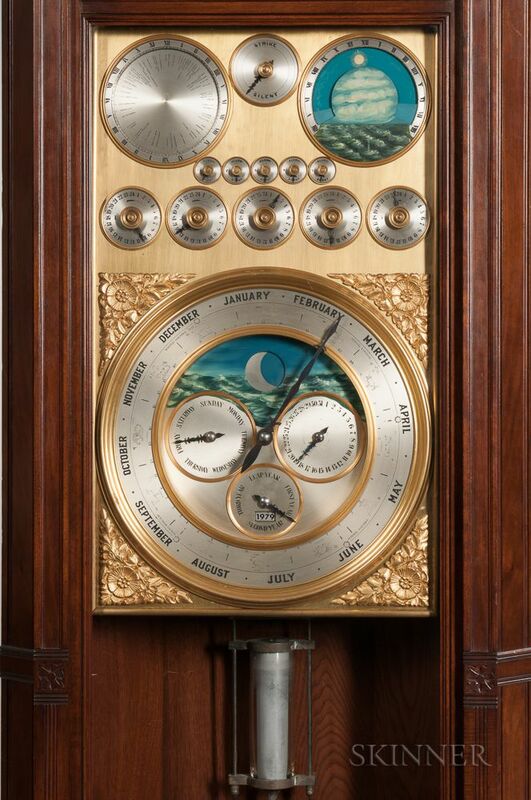 world time and tidal dials, five 1 1/2-in. 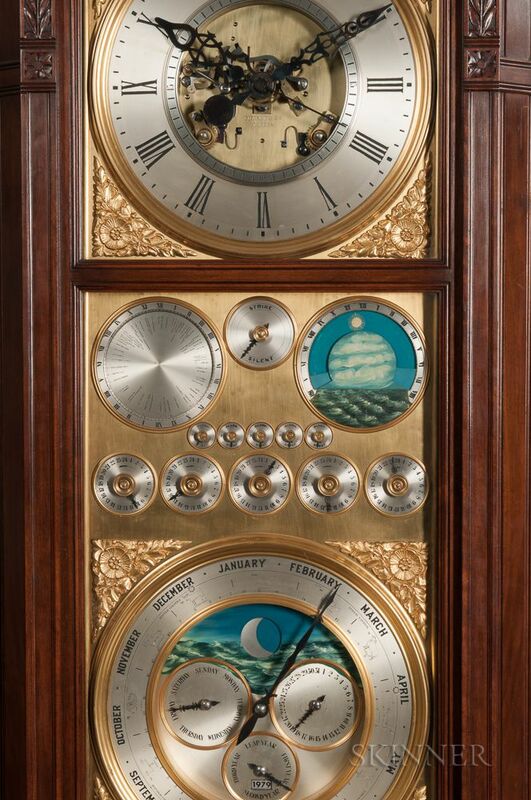 alarm dials, and five 3-in. 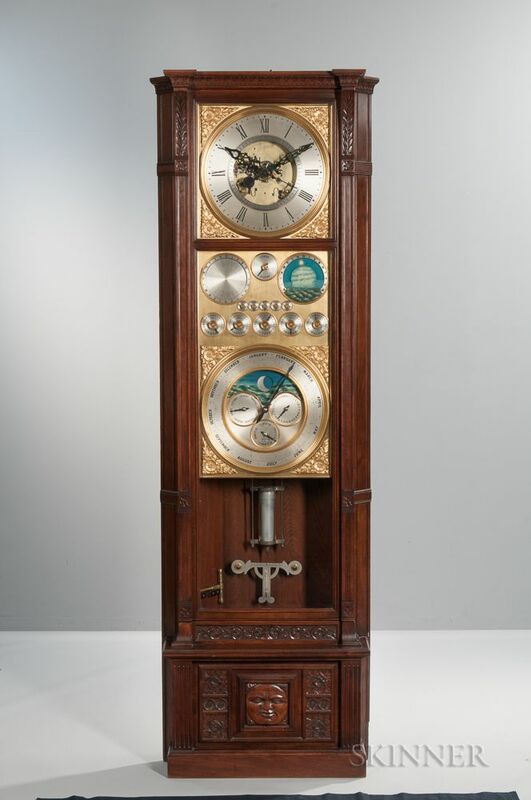 twenty-four hour slave dials, all above the subsidiary calendar dial showing the month, twelve zodiac or astrological signs, day of the week, day of the month and leap years, with engraved aluminum beat scale and thermometer, spring-driven time and quarter-hour striking mechanism with rear brass plate marked "Tiffany & Co. Makers 2," regulated by a single-jar mercury pendulum with regulating knob, ht. 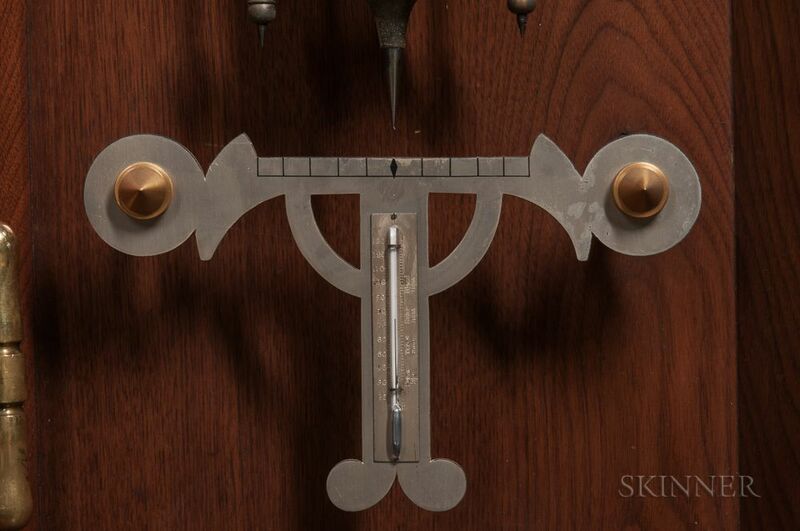 96 in. 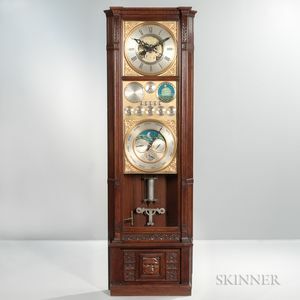 Provenance: A Lincoln, Massachusetts, collector, Skinner, Sale 1673, Lot 596. 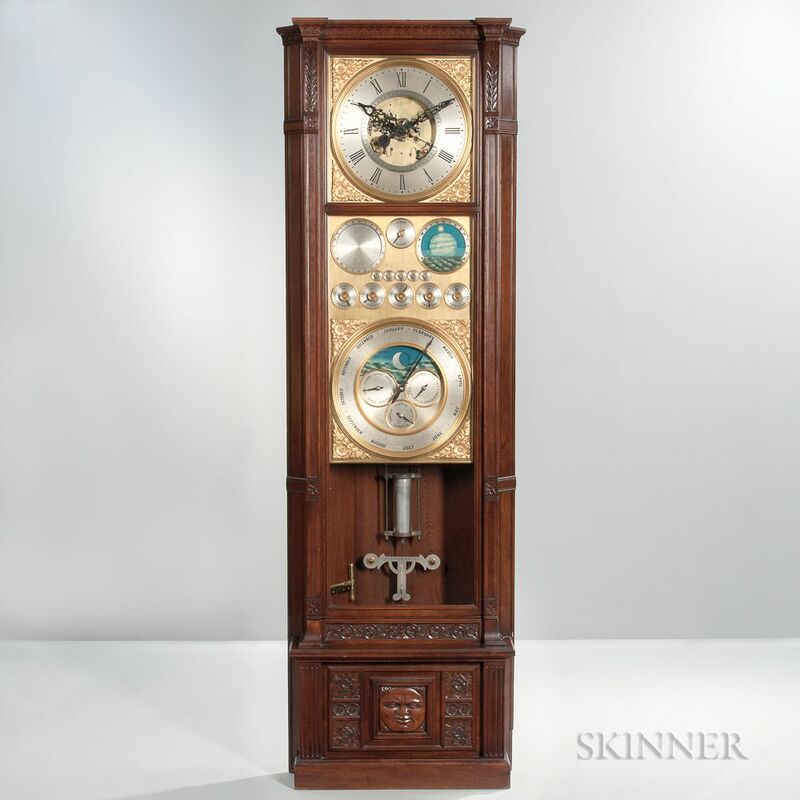 Note: Skinner sold a similar cased clock in Sale 1203, April 29-30th, 1988, Lot 506, that housed a fifteen-day movement. 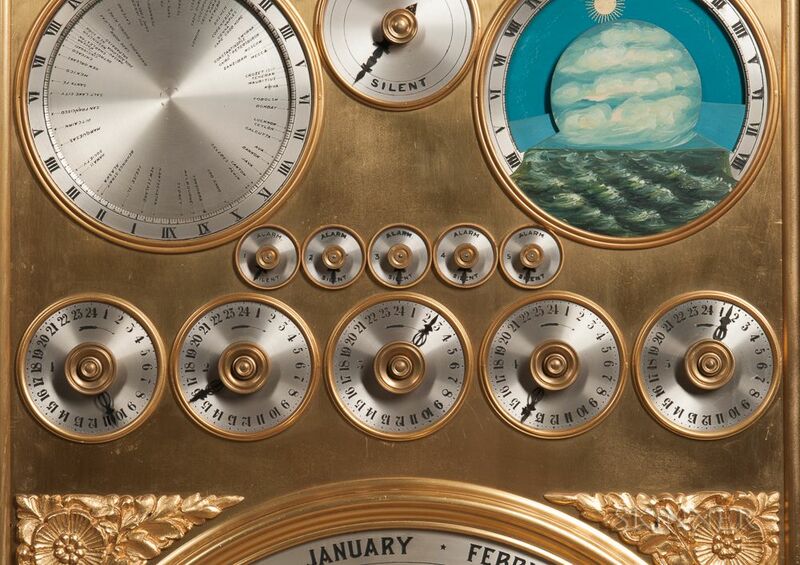 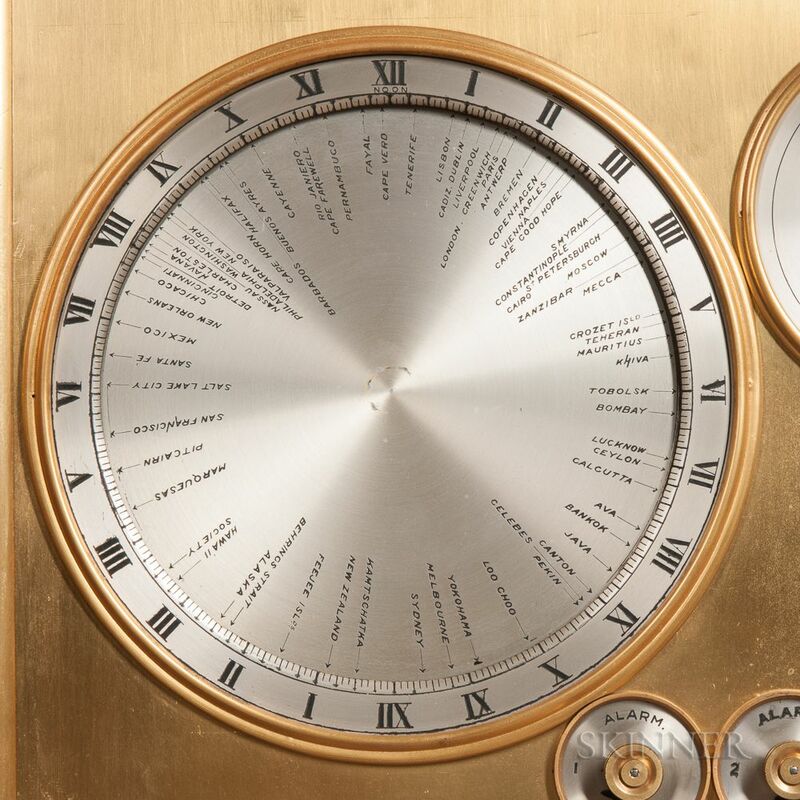 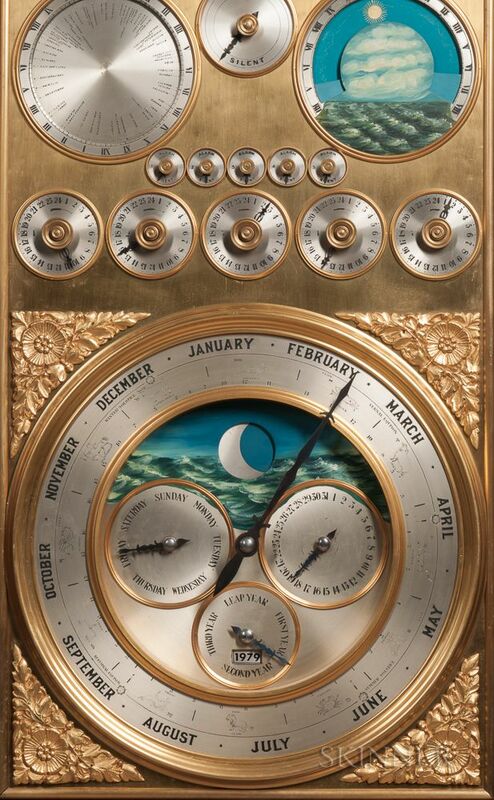 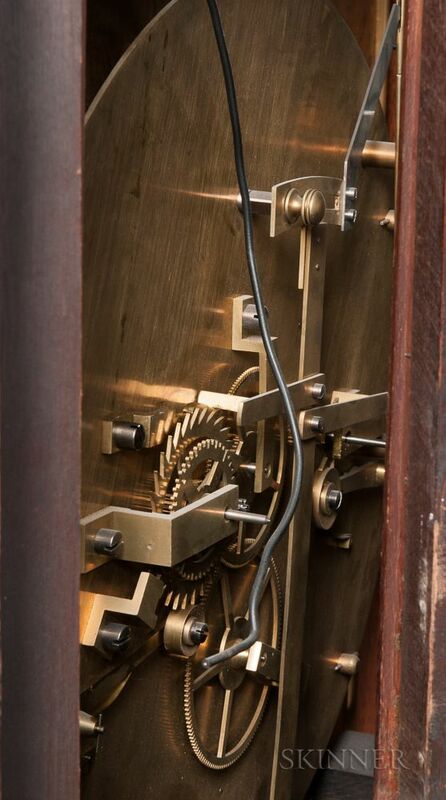 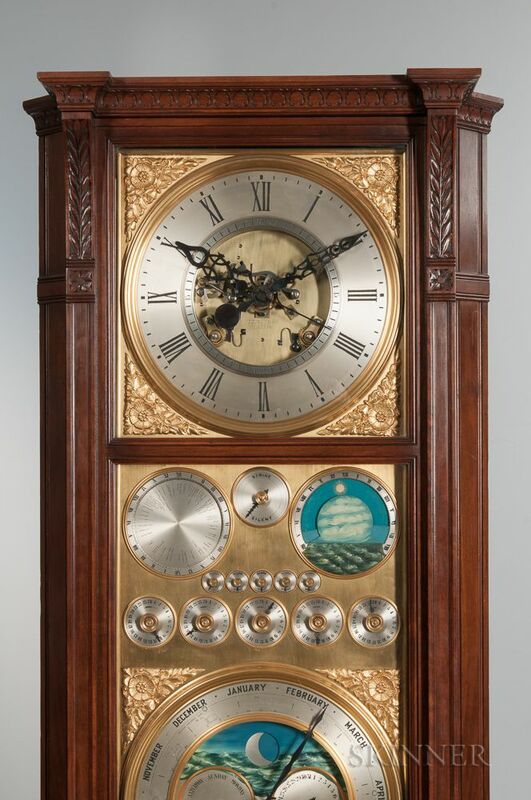 Literature: William Dustin and Robert Bishop, The American Clock, p. 86, shows a Tiffany & Co. clock in a Moresque-style case in the collections of the Metropolitan Museum of Art. 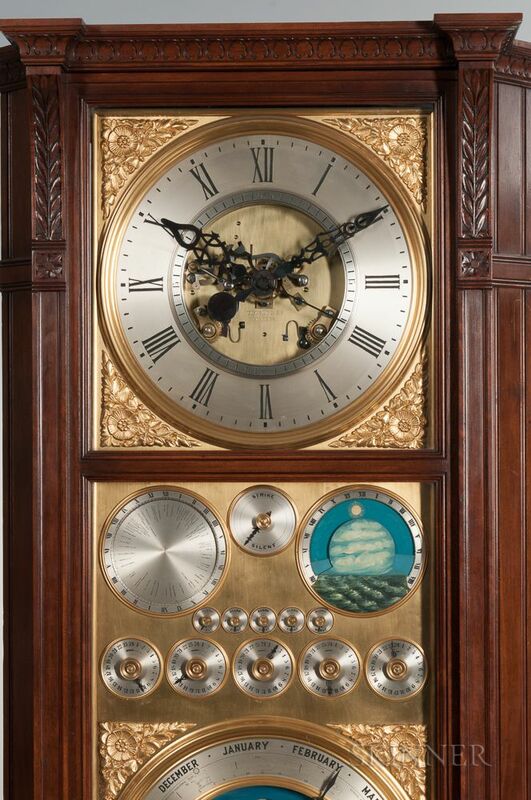 the case does not appear to ever had a fret or cornice but possibly was part of a fully paneled room.